James Taylor and Samit Patel were Nottinghamshire’s stars as they saw their side to a 7 wickets victory over Essex in the Royal London One day Cup contest at the Chelmsford after being set 269 for victory. Their unbroken fourth wicket stand of 215 enabled the visitors to cross the finishing line with 8 balls to spare. Patel, who hit 124 and Taylor 94, had come together with their side in some difficulty after three wickets had fallen in quick succession to leave them 54 for 3 in the 14th over. The feature of their batting was their ability to eschew any risks whilst keeping the scoreboard ticking over smoothly. This was due to their prowess of being able to push the ball confidently into the gaps and wait for the wayward delivery before opening their shoulders to find the boundary. Essex captain Ryan ten Doeschate continually juggled his bowlers in a bid to halt their progress but it was to no avail. Patel posting victory with a six off the Essex skipper to go with 13 fours in his 112-ball effort. Taylor also faced 112 deliveries while gathering 7 fours and 2 sixes in the Outlaws reply of 271 for 3. Before they joined forces, David Masters and Graham Napier had seemingly put Nottinghamshire firmly on the back foot. After Masters had Riki Wessels caught by Napier for 21 on the deep third man boundary to end an opening stand of 42, Napier then followed-up by bowling Alex Hales for 28 in the same over in which the opener had raised the 50 with a six. Masters was to strike again by having Brendan Taylor caught behind by James Foster from the first delivery he received, a dismissal which compounded the Nottinghamshire player’s misery. Earlier, he had been reflecting on his failure to accept a couple of straight-forward catches at deep mid-on to let Jesse Ryder off the hook. The New Zealander was reprieved on18 and 30 and made good his escapes by going on to hit an unbeaten 81 from 66 balls with 7 fours and 2 sixes as the Eagles reached 268 for 8 from their 50 overs..
Essex had been put into bat and the innings had been placed on a solid foundation by Mark :Pettini and Tom Westley. They shared in an opening stand of 80 in 16 overs before Westley, having made 38, was trapped lbw by Patel. Pettini, who excelled with some fine square drives, went on to make 61 from 77 deliveries with the aid of 5 fours. He was eventually undone by an Imran Tahir googly as he attempted to cut the leg-spinner and the bowler then removed Ravi Bopara for 28 with a similar delivery. Ryder and ten Doeschate were to share in a fourth wicket stand of 61 in 11 overs, while Napier struck 2 sixes in a breezy 27 from 18 balls before he was caught in the deep off Jake Ball. Tahir, easily the pick of the Outlaws attack with his teasing flight and variation, finished with 2 for 45 from his 10 overs while Ball and Steven Mullaney picked up two wickets each at a cost of 46 and 44 while sending down 9 and eight overs respectively. 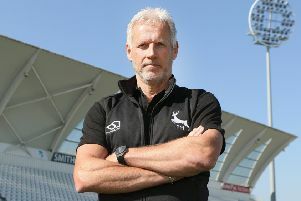 Speaking afterwards about the match-winning innings from Taylor and Patel, Nottinghamshire coaching consultant Peter Moores said: “They are batsmen who can adapt to all forms of cricket and they confirmed just what good players they are. Ryan ten Doeschate paid due credit to Taylor and Patel. “We did all we could to find a way to end their partnership but they batted superbly and showed their class.